Pet Dog & Cat Friendly, Bright And Spacious One Br Unit With Kit, Dining Area, Living Room And Bath. Wall To Wall Closets And Plenty Of Windows. Parking Garage, Enclosed Garden And Laundry Facilities On Premise. Nearby Shops, Restaurants, Major Roads And Public Transportation. 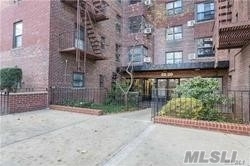 Minutes To Manhattan!